Malta's National Museum of Fine Arts, situated in Malta's capital city of Valletta, contains an eclectic mix of artefacts which reflect the islands' own colourful history. Apart from works of art by leading Maltese and Gozitan artists, the museum collection includes several works by renown artists from varied different countries. This sculpture is one of the most poignantly beautiful ones, at least to my own eyes. 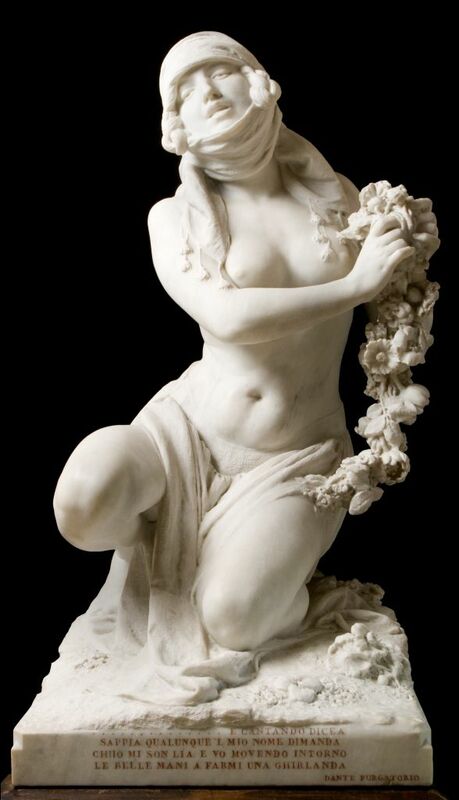 It is entitled 'Leah' and was made by the Italian sculptor Eugenio Maccagnani (1852-1930). The sculpture was brought to Malta from Rome in the early 1930s, by an avid art collector of Swedish descent - Capt Olof Frederick Gollcher OBE (1889-1962) (whose last home in the old capital of Mdina, is today a very important house museum in its own right). The writing on the pedestal beneath the figure, is a quotation from Dante's 'Purgatorio', the second part of his 'La Divinia Commedia'. It refers to Leah, who, according to the Bible, was the first of the two wives of the Hebrew patriarch Jacob and the mother of six sons whose descendants became the Twelve Tribes of Israel. a garland of the flowers I have gathered."